In the eighth century, Sindhis became part of an Islamic Empire, enabling Arabs to enter India. 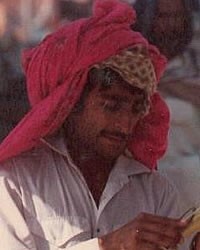 Sindhi people have Persian links that have influenced them. They have their roots in Pakistan's Sindh Province. Pakistan has an important province named Sindh, which is where this people group originated. From there they have migrated to other parts of South Asia, specifically India, Sri Lanka and Bangladesh. Sindhi people in Bangladesh breed animals such as buffaloes and cattle. Many are farmers. Some have gone to other parts of South Asia looking for work, which might explain why some are in Bangladesh, Sri Lanka and India as well as their original home, Pakistan. Muslim Sindhi people do not allow their people to marry outside their community. They are Sunni Muslims who have also been influenced by Sufism. There are Sufi shrines in Sindhi communities. They need open hearts to hear God's answers to their spiritual problems. * Pray for gospel workers to catch a vision for reaching the Muslim Sindhi people for Jesus and that in God’s sovereign timing the hearts of the Sindhi people would be open and ready to follow him. * Pray for Jesus movements to bless extended Muslim Sindhi families so the gospel will spread rapidly among this people group. * Pray for the spiritual lives of the Muslim Sindhi people to become fruitful as they follow Christ. * Pray for the lives and culture of the Sindhi people to evidence the rule and reign of the Kingdom of God as they open to the gospel, and for the beauty of Jesus to be seen in them. https://www.firstpost.com/world/why-india-doesnt-want-sindhis-fleeing-pakistan-694611.htmlView Sindhi (Muslim traditions) in all countries.